See many wonderful photos from the banquet at the end of this article. 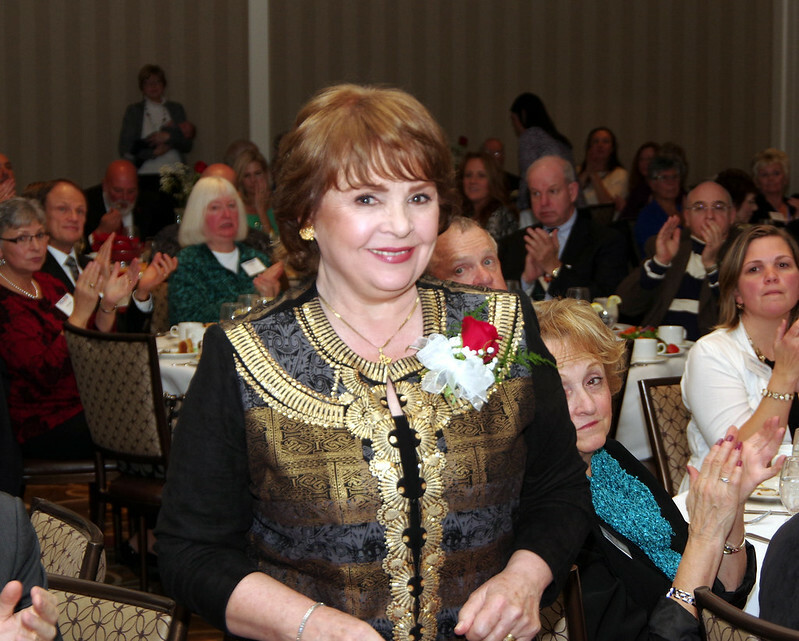 The annual fundraising banquet for MCFL on Thursday at the Four Points Sheraton in Norwood gathered hundreds of Pro-lifers to a room filled to capacity to hear Irish singer Dana Scallon and support the mission of MCFL. Dana spoke to a rapt audience about her own pro-life beliefs, her own confrontation with the realities of life issues and awakening, and her public work on behalf of life. She interspersed her talk with her own songs illustrating the theme of each anecdote. She ended by singing her famous song, Our Lady of Knock as many in the audience accompanied her on the refrain. The evening was also the occasion for recognizing the contributions of pro-lifers on both the local and state level. Those awarded for service to their chapters included Doug Hayman, Marie O'Donnell, and Jane Wilcox. For her service to the board of MCFL, Rosalie Berquist was awarded the Pwggy McCormack Award. And for their contribution to the cause for life through Massachusetts, the Dr. Joseph Stanton Award was given to Dr. Bill and Patsy Lawton. Dr. and Mrs. Lawton had been newcomers to Massachusetts when the battle against doctor-prescribed began to reach its peak in 2012. They worked tirelessly, traveling through the Commonwealth speaking to doctors, legislators, and anyone else who would listen about the dangers of DPS. For embodying the spirit of Dr. Stanton's tireless and relentless legacy, they were worthy recipients of the award created in his name. Of course, they are so tireless that they were unable to be present at the banquet because they were on one of the numerous medical missionary trips overseas. Anne Fox, president of MCFL, also gave her address, speaking of the work that MCFL and its members are doing, the encouraging news that abortions in Massachusetts have declined from their peak over 44,000 per year to less than half that now. But much work remains, she cautioned, mentioning the news that just broke of a lawsuit filed by a terminally ill doctor demanding the courts recognize a right to assisted suicide. Anne noted that as with Roe v Wade, when proponents of assisted suicide failed St the ballot box and in the legislator, they turned to the courts to create a legal right where one did not exist before. After the dinner, attendees expressed their appreciation, while Anne thanked the Banquet Committee; emcee Dwight Duncan; Victor Pap, who made the financial appeal; Ed Boyland, photographer; and the staff at Four Points. Molly: "I have been so blessed to have had this opportunity to witness pro-life activists in action. Being present at this Banquet has given me a sense of belonging in the pro-life community. Maggie: "I really enjoyed Dana's talk, especially her story about her near miscarriage which inspired me to never give up and to trust in God. I also liked when she sang her songs. She has a beautiful voice. I loved her passion in what she was saying and singing." Emily R: "It's beautiful to hear Dana singing. Her songs and voice are so beautiful. It has truly been an inspiration." Yvonne: "Dana's keynote presentation was inspiring and uplifting. Her beautiful singing really made her presentation personal and I greatly enjoyed it. She is not only a talented singer, but a talented speaker as well. Her words were a great inspiration for all of us to be the voices of life in the midst of a culture of death." Alexandra: "I have listened to Dana's music every night since I was quite young. Listening to her words and songs this evening renewed the meaning of life for me as well as reminded me of the importance to respect the dignity of every life at every age." Regina: "Dana's keynote taught me to understand the needs of those women who have had abortions and are in need. Through our generation – the pro-life generation – we can offer a sense of hope and a voice for our society." Gabby: "Dana's keynote presentation was touching, personal and sincere. Her story of her change from passive bystander to active pro-life advocate inspired me and renewed and strengthened my pro-life convictions and desire to speak out for respect for all life." Please Click Below to See Many Photos from the Event.